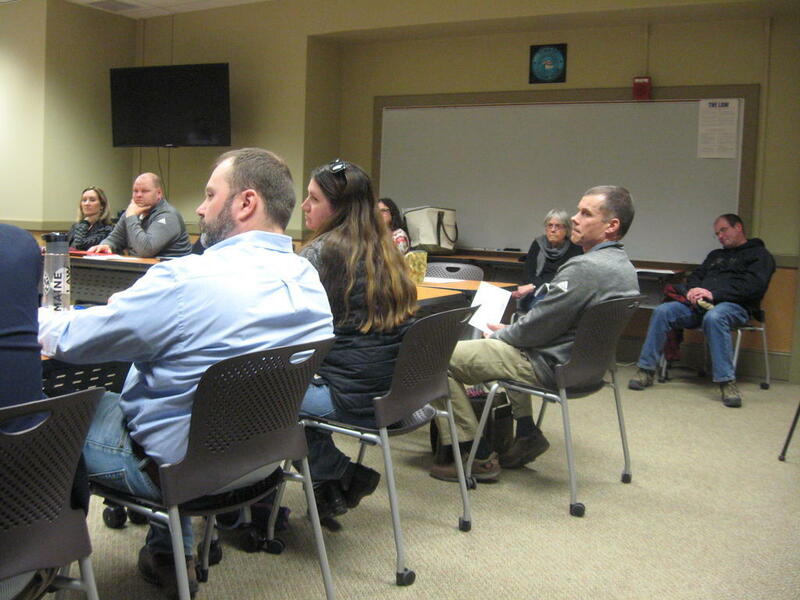 GORHAM — The School Department’s release last week of a $96.8 million initial estimated price tag for a proposed high school project caused a “little bit of a panic,” School Committee Vice Chairman Stewart McCallister said Tuesday in a joint meeting with town councilors. School neighbors met earlier this week to discuss their concerns about escalating traffic congestion under the plan and the loss of part of Robie Park where children play and owners walk dogs. The $96.8 million estimate is unrealistic, officials said. “There’s no way those numbers will ever reach the public for a referendum vote,” School Committee Chairman Darryl Wright said. The High School Building Committee could receive a vetted, reduced estimate by mid to late April, according to consultant Daniel Cecil of Harriman Architects and Engineers, who developed the concept plan. A high school proposal could go to voters in November. School Committee member William Benson said Tuesday that he fears even a $60 million referendum for a high school project would endanger other school district needs, such as plans to open one to three portable classroom buildings next year at Narragansett Elementary School and to deal with failing heat pumps at the middle school. A community forum is set for 6-8 p.m. on Tuesday, March 26, in the high school auditorium, 41 Morrill Ave., about the proposed high school building project. The concept plan is aimed at accommodating 1,100 students. The school’s enrollment is now 868 but projected to grow significantly in the next 10 years. The high school campus provides little space to expand. Meanwhile, alternative ideas have been raised on how to solve the aging and overcrowded high school’s problems swirled around town. At the joint meeting, Town Councilor Ronald Shepard re-introduced an idea that would convert the nearby municipal center, the former Shaw School, into auxiliary high school use. Shepard after the meeting suggested a new town hall could be built elsewhere. The concept plan calls for increasing high school parking from 280 spaces to 442. The municipal center has parking and contains a gym in the Recreation Department. Under the concept plan, a new wing would be constructed by eliminating part of Access Road in an expansion onto part of Robie Park. Loss of a portion of the park and traffic issues have stirred neighborhood opposition, and neighbors met this week at a private home to talk about traffic issues and the impact on Robie Park. “This is a problematic project,” Mike Chabot of Morrill Avenue said. To preserve the park and use of Access Road, Jeff Bolduc of Sylvan Road suggested placing a new wing behind the high school and relocating athletic fields to the middle school on Weeks Road where town land is available. His wife, Lisa Bolduc, hopes neighbors will pack a Town Council meeting on Tuesday, April 2. Ball Park Road leads to town parking for staff and visitors to municipal offices, Recreation Department and Baxter Memorial Library. If Access Road closed, it would throw high school traffic onto Ball Park Road. Toni Chabot said her concern is traffic, safety and emergency vehicles’ access to the high school. Under the concept plan, $250,000 would be earmarked to upgrade Ball Park Road to handle the additional traffic. Lisa Bolduc pointed to future traffic impact with 1,100 students and wondered whether Access Road could be closed. Town Council Chairman Benjamin Hartwell said in an email Tuesday that the seven-member council would have to approve the closure of a town way. The high school concept plan shows locating five tennis courts and a new basketball court in Robie Park. Another neighbor, James Edwards of Sylvan Road, pointed out an existing basketball court in the park has not been maintained. “The park will be clear cut,” Jeff Bolduc feared. Next Tuesday’s forum will be an opportunity for public input. “We want all the ideas,” Benson said following this week’s joint meeting. Gorham Town Council Chairman Benjamin Hartwell, left, Vice Chairwoman Suzanne Phillips and School Committee member William Benson at a joint meeting Tuesday about cost of upgrading the town’s aging high school.